One 10 gm TUBE. COPPER-LINED ALABASTER color 741, size 15/0. Toho ROUND glass Seed Beads. Each tube features a friction cap with a hangable loop. 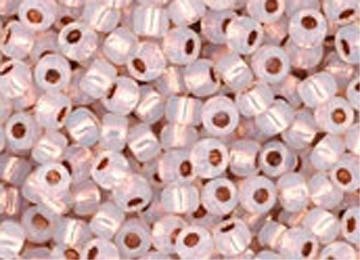 Tubes contain approximately 10 grams of beads (bead weight indicated does not include the weight of the tube). Please note: The image you see is for color demonstration purposes only. You will actually receive size 15 round beads in this color.